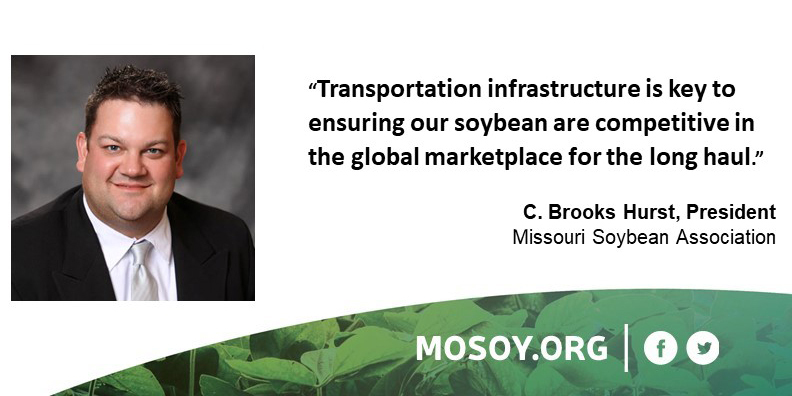 Missouri’s soybean farmers have a long history of investing in themselves for a stronger future, both through their statewide organizations and on their individual farms. The farmer leaders of the Missouri Soybean Association apply that same perspective to decisions on policy, and have therefore elected to endorse Proposition D.
Proposition D would fund Missouri state law enforcement and maintenance for highways, bridges, roads and streets by increasing Missouri’s motor fuel tax by 2.5 cents each year for four years, for a total of 10 cents in 2022. The Missouri Department of Transportation is responsible for the 7th largest highway system in the U.S., but is 46th in terms of funding. Proposition D was referred to the statewide ballot by the General Assembly. Voters have the final decision on this measure when they head to the polls August 7. The Missouri Soybean Association is a statewide membership organization working for soybean farmers on advocacy and education efforts across the state.